The Canadian Space Agency and the Canada Centre for Mapping and Earth Observation are making RADARSAT-1 synthetic aperture radar images of Earth available to researchers, industry and the public at no cost — the 36,500 images are available through the Government of Canada’s Earth Observation Data Management System. The RADARSAT-1 dataset is valuable for testing and developing techniques to reveal patterns, trends and associations that researchers may have missed when RADARSAT-1 was in operation. Access to these images will allow Canadians to make comparisons over time, for example, of sea ice cover, forest growth or deforestation, seasonal changes and the effects of climate change, particularly in Canada’s North. This image release initiative is part of Canada’s Open Government efforts to encourage novel Big Data Analytic and Data Mining activities by users. Canada’s new Space Strategy places priority on acquiring and using space-based data to support science excellence, innovation and economic growth. The RADARSAT Constellation Mission, scheduled for launch in May 2019, builds on the legacy of RADARSAT-1 and RADARSAT-2, and on Canada’s expertise and leadership in Earth observation from space. RADARSAT-1 launched in November 1995. It operated for 17 years, well over its five-year life expectancy, during which it orbited Earth 90,828 times, traveling over 2 billion kilometres. It was Canada’s first Earth observation satellite. RADARSAT-2 data to the Government of Canada during the lifetime of the mission. 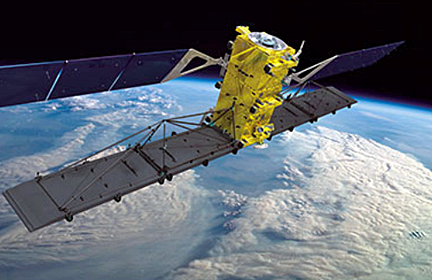 Artistic rendition of a Radarsat-2 satellite. Image is courtesy of MDA. for Mapping and Earth Observation, a division of Natural Resources Canada (NRCan). NRCan is responsible for the long-term archiving and distribution of the images as well as downlinking of satellite data at its ground stations. The Honorable Navdeep Bains, Minister of Innovation, Science and Economic Development, said that the Canadian government continually seeks to better understand the impact that humans are having on the environment. RADARSAT-1 has provided the agency with a comprehensive and valuable group of images of Canada from space and these images can now be shared openly with Canadians so that they can chart environmental changes in the country over time. Mike Greenley, Group President of MDA, said the company is proud to support the Government of Canada in making this valuable data available to the public. The RADARSAT program has and continues to provide a historical record of changes on our planet since the launch of RADARSAT-1 in 1995. MDA continues to work on new approaches that wll extract valuable insights from this rich archive.